My mom taught me how to crochet when I was about 12 years old. I never really completed any projects with just a plain old, double crochet stitch, though. It always seemed so monotonous to me, just to do the same simple stitch, forming rows, back and forth...It wasn't until I was about 13 when someone first taught me how to make a granny square. It was in a van in the 2 hour ride to a youth retreat. I thought they were the coolest things ever! But when I got back home from the weekend, I didn't have any yarn or hooks to use to keep doing it, and quickly forgot how. Eventually, my brother got married, and his wife re-taught me how to make them when I was about 17. I ended up making afghans out of granny squares for my closest friends as graduation gifts. Then, one day, as I was sitting in the college dorm rooms, my best friend and dorm-mate had an idea: I could make blankets, but could I make pants? Only Torie could have come up with an idea like that! She may not be creative in the sense of creating things (like with crocheting) with her hands, but has a true artist's vision. (She can draw like nobody's business, too...) If it weren't for her idea, I likely would never have thought to try. 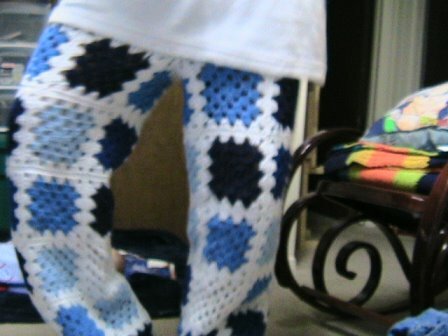 I had no pattern to go with, but the pants began to from under my very fingers. I was actually quite surprised and pleased with how well they turned out. It was the first time I'd attempted anything other than afghans, and it was a major success! In fact, about a year later, when she was living in a 1-bedroom apartment on her own and she couldn't afford a high heat bill (which is inevitable with Colorado winters), she would wear the pants. She said it was like wearing an afghan. LOL To this day, the thing I make most often is afghans, as their the easiest and quickest to make, but I've also learned to try new patterns, try to create patterns with my own ideas, and will very soon be expanding my crocheting projects and abilities. All because one day, she walked up to me and said "Hey, do you think you could crochet me some pants?" So Torie....THANK YOU!